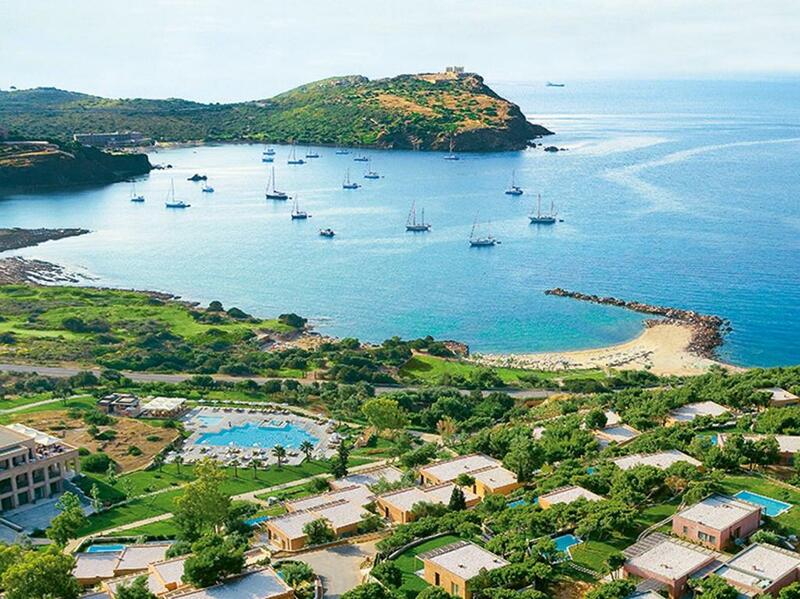 Lock in a great price for Cape Sounio, Grecotel Exclusive Resort – rated 8.4 by recent guests! Beautiful hotel neat the city.perfect 2 days escape!great staff and really relaxing atmosphere! Small bungalows in the middle of beautiful gardens with views to the Poseidon temple. Private (stony) beach with bar (apparently in summer also restaurant). Fantastic breakfast. Service excellent. I liked the view of temple of posaidon and the beach. The room was clean and staffs are all kind and friendly. They helped to call a taxi and arranged a tour for me and also prepared a bag for breakfast. Their services were great! The staff were very helpful if somewhat badly trained. I.e we requested lots of toast for breakfast in the room and we received a frozen sliced loaf of white bread in the bag.. Only the buffet restaurant was open despite advertising 5 restaurants. There were no child's activities available despite advertising them. The food was terrible with no attempt to cater for veggies, vegans despite having 3 months advance notice. We checked out of the very old and dated hotel after 2 nights..
Breakfast options were plenty, and staff at breakfast were very attentive. Room was spacious and bed was comfortable. The room was beautiful, we had complimentary wine and snacks waiting for us in the air conditioned room. I LOVED EVERY PART OF THE HOTEL. THE LOBBY INSIDE & OUTSIDE IS AWSOME. THE RESTAURANTS ARE GIVING VERY FINE DINING. THE BEACH RESTAURANT IS SO ROMANTIC. THE SPA IS VERY GOOD. ALL THE STAFF WAS VERY FRIENDLY & EFFICIENT. I liked the pool and the location.Also the breakfast and the music events at the lobby bar. Cape Sounio, Grecotel Exclusive Resort This rating is a reflection of how the property compares to the industry standard when it comes to price, facilities and services available. It's based on a self-evaluation by the property. Use this rating to help choose your stay! Overlooking Sounio bay and set within a pine forest, Cape Sounio, Grecotel Exclusive Resort offers private sandy beaches, a state-of-the-art spa and gourmet dining in luxurious settings. The resort features terracota-colored bungalows and private villas set amid stone-paved paths and olive trees. They offer spacious living and dining areas, while most enjoy spectacular sea and pool views. In-room facilities include a satellite TV, DVD player and bathrobes. Elixir Spa is set on a cliff overlooking the sea. Apart from the indoor pool, the saunas and the gym, the spa also offers a juice bar, a restaurant and a beauty salon. Cape Sounio offers a variety of restaurants with spectacular views of the Temple of Poseidon. Dining options include Greek and international cuisine, Cretan dishes made with organic products, creative Asian delicacies and fine seafood. Special diet menus can also be prepared on request. Athens International Airport is within 25 mi. The small coastal town of Lavrio is just 6.2 mi away. The resort also offers private yacht cruises to the neighboring islets. When would you like to stay at Cape Sounio, Grecotel Exclusive Resort? A unique open-plan design and large sliding glass doors mimic the expansiveness of the Cape Sounio and its bay. Step onto the terrace to enjoy the side views of the Aegean and the Temple of Poseidon. Each bungalow features a master bedroom with a private dining and living area, including a sofa bed for a third guest. Family Bungalows feature added comforts required by families traveling with children. The master bedroom sleeps 2 adults and connects with a dining alcove, while the spacious living room includes 2 sofa beds. Offering Aegean Sea views, this spacious villa is decorated with hand-crafted furniture and includes a luxurious marble bathroom, 2 bedrooms and a large private garden. It opens to a balcony or terrace with bamboo furnishing. This spacious villa features artwork and hand-picked furnishings and includes stylish dining and living areas. It offers sea views. Featuring earth tones, hand-loomed textiles and individually-selected furnishings, this bungalow includes a master bedroom, a dining area and a spacious marble bathroom. Floor-to-ceiling windows open out to a patio where you can relax and enjoy the terrain. Featuring earth tones, hand-loomed textiles and individually-selected furnishings, this bungalow has a master bedroom with ensuite dining area and a spacious marble bathroom. Floor-to ceiling windows open out to a patio where you can relax and enjoy the terrain. -a 60-minute spa treatment for 2 people (reservation needed). House Rules Cape Sounio, Grecotel Exclusive Resort takes special requests – add in the next step! Cape Sounio, Grecotel Exclusive Resort accepts these cards and reserves the right to temporarily hold an amount prior to arrival. A. Definitely the passé open bath and those old- fashioned leather shades which affect not only someone’s privacy but also his/her right to an undisturbed sleep in the morning thanks to the penetrating sun rays coming directly from the window . B. The bed was an absolute disaster- two single beds poorly attached to eatch other by that piece of cotton strip . C. There were no spare douves /blankets in the wardrobe. We enjoyed the unique location of the hotel. We also loved breakfast in the terrace. Excellent quality and variety of food. Finally, we found the staff very helpful and polite. We would come back to enjoy the outstanding view the hotel offers plus the fantastic private beach. Unfortunately there weren’t enough tables for breakfast on the weekend (even downstairs). Had to ask for a duvet in the room which should be standard. Room furniture and facilities need to be upgraded given the price of the rooms. We were not thrilled with our room (superior bungalow with garden view). While it was clean and spacious, it could use a renovation (couch, bed, bathroom feels like in the 90s). In a potential next visit, we will definitely prefer a sea-view room, which also offers easier access to the main areas (reception, pool, beach). We stayed at Cape Sounio for a weekend (2 nights) and we had a great time. The hotel’s location is wonderful, offering a great combination of sea & mountain views and access. The staff is truly professional and friendly. The beach is beautiful and clean and the pool area is ideal for relaxation and lunch. We liked the breakfast, although it could offer some more wellness/healthy options for picky visitors like us. Finally, we had a fantastic dinner on Saturday night with Greek fish buffet, drinks and music. The photos made the place appear much nicer then it was in person. Although it was still beautiful. Although we are a family with 2 small children and a baby pram they put us in a bungalow where the access is through stairs (about 30 steps).The animation team for kids practically does not exist. The external wooden door at the bungalow must be there since the 80's.Many members of previous greek leading party PASOK are among the clients of this hotel. The staff of the main lobby was very helpful especially the assistant in the front door with blue costume. Unfortunatelly the day of the check out a lady in the reception was always calling us in the room to leave quickly even if we had already ask for later check out though booking, because we had the permission to request for that. In conclusion we are satisfied and we could visit again that place. Breakfast, food, front sea, facilities etc. were excellent. Food was over priced and the quality was average. The food is mediocre so as the staff. I liked the beach, the resort, the friendliness of staff. I also liked the food. Maybe lack of Greek cuisine dishes in a menu. More vegetarian or vegan options and marking them in menus. Also staff was not very flexible or trained how to deal when you want to order only half of a meal or just some ingredients from it. The best thing for me was a respect for privacy - the bungalows are arranged in a way that you can be in a big hotel and still have a feeling of a private property. We booked sea view and 511 was not! Renovation is needed to the room to become 5*. We are glad we did not booked for more. Very expensive coffee and juice on the beach. The toast is of very poor quality(bread and cheese) when the salad is acceptable. No warning for the sea urchin. This is not the time of the year to work on landscape with bobcat! We came to relax even for the short time of two nights. Unique position in the world! Clean beach. The restaurant by the sea is a must! Excellent food. Very warm and friendly personnel.